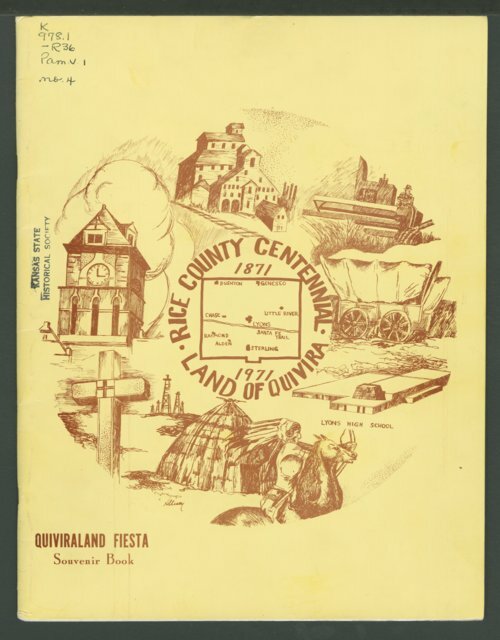 This souvenir booklet, published by the Rice County Centennial Committee, covers 100 years of history in the community. The book is divided into sections and covers topics from Coronado's expedition, the Santa Fe Trail, the formation of the county, selecting a county seat, agriculture, oil, and salt. There are brief histories of Lyons and Alden. Sections are also devoted to historical images of pioneers, businesses, and churches. At the back of the publication is a list of sponsors and patrons who made contributions. Arthur C. Hodgson was chair of the centennial committee.